Here I sit looking out at a most beautiful snowfall. 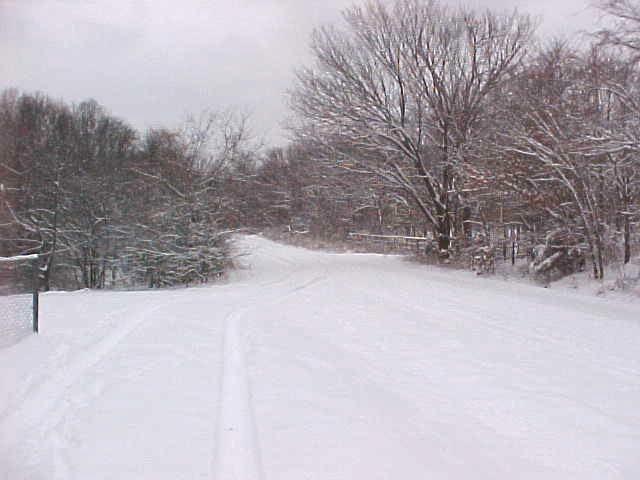 Many of you live in areas of the country or in other countries that experience snow regularly. For me it's a new experience and yet it isn't. About ten years ago Byron and I lived in Salt Lake City through one winter. We experienced a lot of snow and learned how to drive in the stuff. But to sit on this mountain ridge and look out our windows into this rural setting is unbelievably awe inspiring. I love this area and living in the country; it's so serene. There is nothing like the "quiet" that comes after a good snowfall. Serenity has been my goal and also my measuring stick for some time. I've used the "Prayer of Serenity" not only as a prayer but as my measuring stick to let me know when I've stepped out of peace, or when future plans may take me into some situation that is potentially chaotic. When I used to be a drama queen, it was difficult to know beforehand if I was facing something that could upset me. Today I live for the most part in peace. When I become upset, I now recognize that I am out of my peaceful state. This is a big step forward for me, because for so many years I didn't realize I was upset until I was raging. When I realize that I'm not at peace now...I ask myself, "What can I do to get back to Peace and Serenity?" We are like everyone else, having a human experience, at times forgetting that we are really spiritual beings in these bodies. I can get caught up in old patterns and find myself out of peace. Just last week, Byron was enjoying himself. He is a tease and loves to tease me. I was all right when I went in to take a nap, but I wasn't when I awoke. He teased, not knowing that something within me had changed, and I was completely out of peace. There is no longer the loud expression of anger, but I did pout. I pouted the whole next day. In the morning I was already forgiving everyone associated with my upset. I knew I had been the one who had caused it. But it felt so good to pout, I decided to take the day to enjoy the good pout I had going. It wasn't hurting anyone and I knew that as soon as Byron returned to our home from his office, (which is 120 feet away from the house), I was going to make up with him. My form of pouting is being extremely quiet, to the point of being rude. I took the day to really work with this idea of being and living in peace. What I found was that I was angrier with myself than with anyone else. There is an old adage in Spanish that says, if a person gets angry, he has two chores, or two jobs. First he gets angry, then he must become content again. This was certainly true of me. I had gotten out of peace, whether it was deliberate or not, and then it was totally up to me to return to peace. One of the first things I reminded myself of is my commitment to live Mother Mary's message. I'm learning to love unconditionally all the time. Most of the time I do fairly well. But there are times, generally, when I'm not at peace, that I forget and fall back into old habits of judging myself and others harshly. I remind myself how good it feels to love unconditionally. I think this is true because I'm relieved of having to make decisions about people. When you love unconditionally it isn't your responsibility to grade your loved ones or to keep up with how they are doing. In recovery language it's called taking another person's inventory. When you love unconditionally, you're only responsible for your own inventory or inner work. This leaves me free to live in peace as long as I can forgive. Forgiveness is the best and easiest way to get back into a state of peace. I forgave myself for becoming upset, and I forgave Byron for taking offense at my upset, and I forgave everyone else who was involved, no matter how trivial their participation was. We can live in peace every day. It takes work on our part; it takes us becoming aware the instant we are out of peace, and it takes our wanting to return to peace. But most of all, it takes love...unconditional, non-judging, and continuously giving. See, I can remember when I used to withhold my love to punish a loved one. Isn't it amazing the things we do to our loved ones, in the name of love? But now I know that unconditional love flows freely; it's never withheld for any reason. That doesn't mean I don't get angry or upset. It means I don't forget my primary objective: to love without judging, to live filled with inner peace all day, and to forgive myself and others as soon as I recognize the need for forgiveness. Believe me, it gets easier with practice. This way of life really leaves us free to enjoy life, to live comfortably and to have fun. It has opened me up to using my sense of humor in good ways. I used to use my sense of humor to put down, to discount, and to be the first to point out my own failures. But now I find that we can have a sense of humor without the put-downs, or pointing the finger at errors. I thank my mate and partner for teaching me this very important lesson. Byron has a wonderful sense of humor and for this reason our marriage and life together is fun and enjoyable. I thank God for him. So take it easy on yourself and remember you can always forgive and get back into peace if you find yourself uneasy, or upset. I hope these little thoughts help you in some way. If not, understand that you have helped me by listening and I'm very grateful to you. From our beautiful "green country" which today is white, I send my love and good thoughts. Until next time, I remain your friend. It is with pleasure that I come with a message of goodness. Let your hearts be filled with hope and faith, for never once are you separated from our Father who created this and all worlds. Let your whole being be filled with the hope that all things in your lives will be better. That what is transpiring in your life today is just. It is good and it is loving. I realize that not all blessings come cloaked in the appearance of goodness. Many times you seem to have problems, or difficulty. But for today, let us see that what appears to be a problem can truly be the greatest lesson and the greatest blessings that you have received. Maintain faith and remember that faith is the substance which creates the good you seek. Faith is important because without faith you have nothing to build with. When we say faith is the substance, I mean that faith is the building blocks which the Spirit of God uses to create good in your life. So how do you maintain faith? How do you increase your faith? You maintain your faith by using it. Faith, like the muscles in your body, will deteriorate if not used. Faith then is what is needed in today's world. The faith that will build and create the good that you seek. Faith that says, in spite of the appearances to the contrary, I trust that God will provide for my every need. It takes only a small amount of true faith to build worlds and universes. So do not be dismayed with the appearance of difficulty or the appearance of wrong or bad. These are not true sight. It is the sight of fear. Fear tears and erodes faith. It is important to keep your faith as free of fear as you can. You do this by remembering that you now believe in God's eternal Love. I have imparted over and over messages on God's Love and have shared with you how very much you are loved without judgment and without prejudices. This is Truth. My little children, God loves you and will keep you in His love. Have faith in this. Keep this thought in your mind when your fear for the future overcomes you. Nothing in your future is to be feared, not predicted tragedies, nor my own predictions for the future. You live eternally, and so there is no need to fear anything in your future. You can always be maintained in His love and His protection. God loves; He loves you so much that it is not His desire that anyone would be outside of His love. But also God created you with free-will choice. He gives you His abilities. He has imbued you with His great capacity to build, to create, and to form. When you are learning to build out of faith, you are using God's creativity. You are using His clay, you are working in His studio and laboratory. Faith then is the belief that God is with you at all times. It is the belief that you are always surrounded by His love. It is the belief in God's Goodness and in His Wholeness. Keep the faith, my little children. Allow only the thought that you are loved, protected, and guided to help you overcome the fears which assail your being like a storm. Let the thought that you are ever connected to His Wholeness free your mind to see possibilities instead of problems. Let the very Spirit of God infuse and imbue you with Whole Essences. Then you will put aside the fears for the future. You will turn away from the hopelessness that can overtake a person when he loses faith. Until I return to you with a new message, please, my little children, keep the faith. Maintain hope in your heart and believe wholeheartedly in God's love. Faith in a loving Creator allows you to believe in yourself and in your abilities, because God is the Creator of all that is in your life when you turn to Him. Daily pray for faith and daily pray for your loved ones to maintain their faith. God is whole, that means there is nothing lacking in Him. He is complete and total. All that you need you find in our Father. Hoping that things in your life will unfold in loving ways and become better is all that is needed to maintain faith. The future is bright when you can see that all things that come to you are lessons and are ways for God to have a better relationship with you. Believe that no matter what the appearance, the outcome is and will be good. Believe that you are truly connected to a loving Father who only awaits your call. He is allowing you to choose and to decide. He is bringing you to wholeness one step at a time. Let this be the thoughts that fill your heart with joy and with deep pleasure. I am loving you each more than you know. I consider an emergency a short-term situation where things will return to normal in a few days, typically within 72-hours to a couple of weeks. A survival situation I consider a lot longer, maybe anywhere from a month to tens of years. Why is this distinction important? Later I'll discuss replacement filters and how many gallons of water a particular filter will handle. For now consider the importance of water: Gordon-Michael Scallion, of the Matrix Institute, once said that in the future there will be a time when water may be worth more than gold. In case this is hard to believe, just think about this simple example. Just imagine yourself in a hot desert and you're very thirsty, not having had anything to drink in a couple of days. You stumble upon an encampment where there's a person and he has several containers of water. You just happen to have a few gold coins in your pocket and the other person is willing to trade a gold coin for a gallon of water (that would normally cost you a few pennies from the faucet). What would you do? At this point most people would realize that the water at that moment has more value than the heavy metal coins. I used the term "potable" water, meaning fit for human consumption, or safe to drink. The old saying "Water, water, everywhere...but not a drop to drink" comes to mind when I think of the need for a water filter. B&A carries two premier lines of water filters: Katadyn and SweetWater. Katadyn, made in Switzerland, has been the standard in water filters for many years. Their filters are used by the International Red Cross, the Peace Corps, the United Nations, the World Heath Organization, missionaries everywhere, and many others. SweetWater is fairly new, but have introduced less expensive units designed for campers and outdoor enthusiasts. Both companies have excellent products. Typically, I recommend the Katadyn ceramic-based products for survival, and the SweetWater products for handling emergencies, and camping and outdoor applications. Katadyn's next unit is their Mini Filter (MF) that also uses the same type of ceramic filter, only smaller, and it is rated for 2,000 gallons before the filter needs to be replaced. The MF is ideal for those traveling to other countries who need to protect themselves from the local water (i.e. : Montezuma's Revenge). It is also the unit I provide in most of my custom emergency kits. Katadyn has recently introduced another unit that uses two filter technologies to purify water. The COMBI filter has both a ceramic filter and an activated carbon filter. The activated carbon filter removes dangerous chemicals, or nauseous flavoring. The disadvantage of the carbon element is that its capacity is only 60 gallons, while the ceramic element is rated for 14,000 gallons. But this combination would make it the best filter for emergencies, in situations where additional carbon elements can still be obtained when needed. The COMBI can be operated without the carbon element if needed. SweetWater (note 1) has been the innovator of good, economical water filters. And they have been the leader in trying to set standards for water filters and purifiers. The SweetWater products remove 99.9999% of the disease-causing waterborne bacteria. SweetWater has recently introduced their WalkAbout as a lower priced unit with the same filtering capability as the Guardian, but will only handle 100 gallons before filter replacement. This is the least I would recommend for everyone to be able to handle short-term emergencies, or for outdoor camping and similar activities.